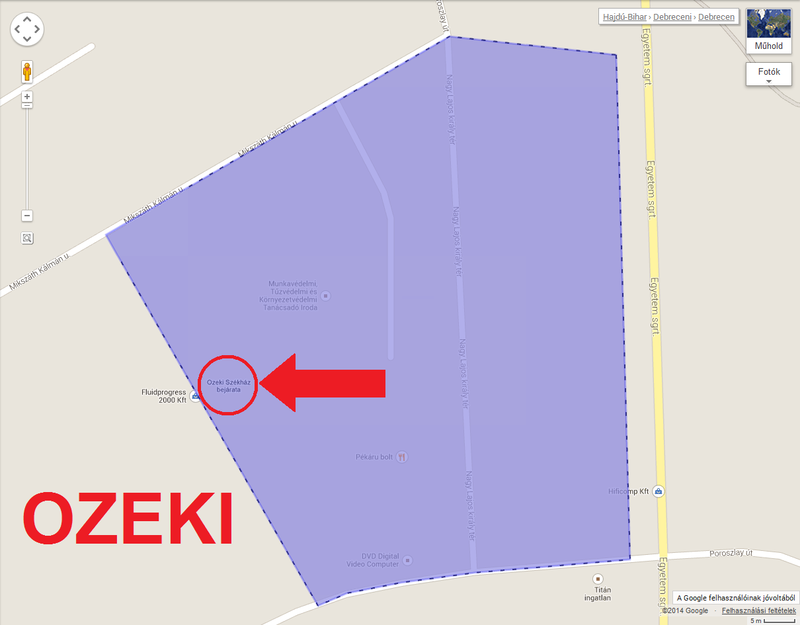 Short company name: Ozeki Ltd.
How to get to Ozeki Headquarters? Debrecen can be reached by train or intercity bus from several directions. The train timetable can be found at the official webpage of MÁV-START Zrt. ; while you can check the intercity bus timetable at this site. Our office is located right next to the bus stop called Nagy Lajos király ter. You can buy bus ticket at the ticket office of DKV Zrt. at the Railway Station, or from newsagents in advance at favorable prices, or you can get ticket from the bus driver at higher prices. The Debrecen International Airport ensures seamless air transport from/to many countries. You can get more information about the timetable at the www.airportdebrecen.hu website. If you arrive from Budapest or Miskolc on M35 motorway, it is recommended to leave the motorway at the West of Debrecen, Hortobágy exit. At the exit, you need to turn left and go ahead towards the downtown until you reach the tram tracks. After passing through the tracks, the Malompark shopping center and an OMV petrol station can be seen on your left. After the petrol station turn left to the Egyetem sugarut. Turn left again at the second option, then immediately turn right and park your car in the parking lot. From Szolnok, Hajduszoboszlo or Nyiregyhaza, Debrecen can be reached on the main road No. 4. (If you come from Mateszalka on road No. 471 or from Vamospercs on road No. 48, it is also recommended to continue your travel on the main road No. 4 after arriving into the city.) It is advisable to go to the Arpad ter on the urban section of the main road No. 4, then turn to the Nyil utca. Go straight ahead on this street until you reach the tram tracks (this is the Bem ter). Here you need to go straight ahead. After passing through the tracks, you need to turn right at the next crossroads to the Egyetem sugarut. Turn left at the second option, then immediately turn right and park your car in the parking lot. You can get to the downtown from Szeged or Romania on the main road No. 47. Go straight ahead leaving behind the Debrecen Plaza until you reach the Kolcsey Center. At this crossroads you need to turn right to the Bethlen utca. Go straight ahead to the Nagy Lajos király ter. Turn left at the fifth option, then immediately turn right and park your car in the parking lot. Hotel Divinus is a five-star hotel at Nagyerdo that is one of the greatest "green area" in Debrecen. 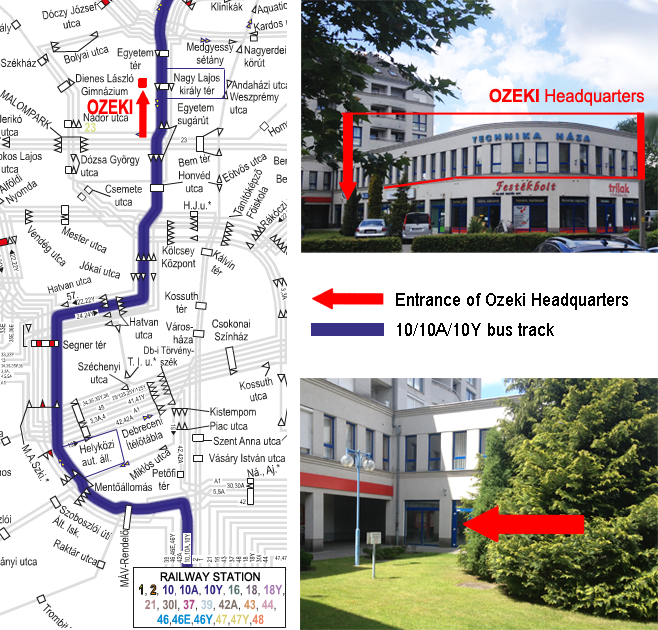 Hotel Divinus is about 15 minute from Ozeki Training Office by car. It can also be reached by public transportation easily. You can inquire for prices via telephone: +36 52 510 900. Hotel Postas Udulo is a three-star hotel at Nagyerdo, as well. This hotel is about 15 minutes from Ozeki Training Office by car. 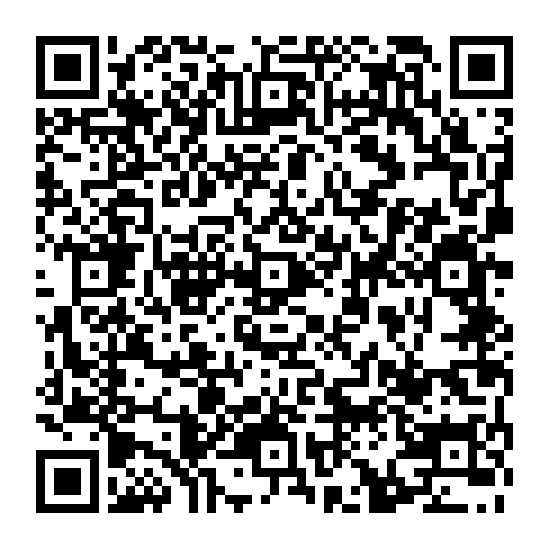 You can inquire for prices via telephone: +36 52 421 044.